Some basement waterproofing companies feel that the best and only way to truly guarantee that a basement won’t leak is to perform major work to the exterior of the building. The theory behind their thinking is to stop the water from ever having a chance to get into the basement. This actually is a very sound approach to the problem. It is very expensive. For those who can afford this and can afford the construction consequences that go along with it, this is the right approach for them. 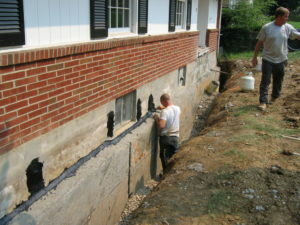 What this solution entails is the digging up of the entire perimeter of the home; applying proper measures to the existing foundation wall (generally this is a patented system that each company is promoting as their exclusive cure all system); applying their waterproofing and drainage system; and then refilling the trench with gravel and finally dirt. The homeowners are then left with reinstalling landscaping, walkways, driveways, patios, porches, or any other elements that got in the way of their system. These solutions tend to run in the 10s of thousands of dollars. One thing I will say is that they generally really do work and the guarantees are realistic. This is a very aggressive solution that does solve the problem. Some basement waterproofing companies feel that the exterior major surgery approach is overkill and that you can save significant dollars by dealing with the problem from the interior. This approach allows or rather accepts the fact that water will come into the basement from the exterior, and attacks the problem by applying a perimeter drainage system where the foundation wall meets the floor slab. Generally this approach only is applied to areas where noticeable water infiltration has been observed and not necessarily the entire basement. This is very desirable to many homeowners because it is far less costing than dealing with the exterior approach. The solution entails cutting a one or two foot wide trench at the existing floor slab along the affected wall area. Then the workers remove the concrete. Next they dig down about a foot deep. The company’s patented perforated pipe system is then installed to collect the water that has infiltrated from the exterior. This pipe system is then connected to an existing basement drain or sump pump situated below the basement concrete slab floor. Generally, the only construction item that the homeowner is then responsible for is replacement of a finished floor and possibly some finished wall fixing. This is a very good approach and most of the time will solve the problem. Because it is not attacking other areas in the basement, there always exists the possibility that other areas may have problems in the future. These solutions tend to cost in the low thousands and the companies will guarantee their work. The problem is that they will only guarantee the area that they did the work on. This approach targets a specific issue and tries to solve it. For example: If there are cracks in the basement wall, and it is observed that when it rains, water comes thru the cracks, it is logical to deduce that these cracks are where the problem lies. In this case it is reasonable to assume if you patch the cracks with the proper material, you can stop the leaking. This is not always the case, but many times it is all that is need to solve the problem. Unfortunately, if you call a waterproofing company that has a major surgery approach system, then be prepared to be given an estimate in the 10s of thousands. It is sometimes difficult to determine which company will have which approach, so my advice is get multiple estimates and compare. I recently had a client that got estimates for a basement leak that ranged from $800.00 to $18,000.00. Another common solution is one that I personally experienced. My basement is 30 years old and up to the first 25 years of its life never had a problem with basement leaking. About 5 years ago during a heavy storm, my basement floor started to leak in the middle of the basement. Since I did not have a sump pump, I deduced that water had, over the years, worked its way under the basement slab and was now coming up in the control joint cracks in the middle of the basement floor. I installed a sump pump as close to the area as practical and was able to solve the problem. Now every time it rains, I hear the sump pump pumping the water back outside and safely away from my finished floor. One other comment: I think it is important, when talking about having problems with water in basements, to talk about plumbing. Sometimes basements flood through no failing of the construction, but rather a backup in the plumbing system. This occurrence is mainly limited to older homes in older neighborhoods. When older neighborhoods were built, many public sewer districts allowed for what is called “combination sewers”. What this means is that the exterior gutters, downspouts, and yard drains that carry storm water were tied directly into the main sewer system of the house. Now, back then the local sewer district could accommodate the “overload on the system” caused by a major rain storm. Today, with all the new subdivisions, many sewer districts cannot keep up with the huge demand on the system that a big rain storm can provide. Newer code regulations now require a separation of storm water and sewer water for new construction. The problem is that we still have these homes with combination sewers still attached to an overloaded system. What happens when we get a major rain? The sewers back up because there is not adequate size piping to channel the rush of water all at one time into the system. There are options to solve this problem. The first is to disconnect all storm related water pipes from the sewer lines. This may be easy to accomplish for a downspout, but not so easy for a yard drain. The second it is install backflow preventers. Contact a professional plumber for details to see if this is a viable option for you. As always, you can find this and many other articles on my blog page at my website www.stanbetter.com . If you would like further information, or if one of my companies can provide construction services to you, please do not hesitate to contact me.